Back matter includes an epilogue, an afterword, explanations of poetic forms, and resources. Lesléa Newman is the author of more than sixty books for children and adults, including the groundbreaking children’s classic Heather Has Two Mommies. A former poet laureate of Northampton, Massachusetts, she has received poetry fellowships from the National Endowment for the Arts and the Massachusetts Artists Fellowship Foundation. She lives in Holyoke, Massachusetts. Newman’s language serves the voices well, the poems always simple, accessible, and moving. These poems are sure to instill much-needed empathy and awareness to gay issues in today’s teens. Newman deploys a wide range of poetic forms, including pantoums, villanelles, haiku, and concrete poems, but all share jagged rhythms and a biting sense of grief and helplessness. This title is perfect for any secondary library; it is a brilliant example of various poetic forms and deals with several issues from a variety of perspectives. This book is incredibly thought-provoking and will have a gut-wrenching impact on the reader and discussion groups alike. Newman’s verse is both masterful and steady-handed. Each poem is beautiful in its subtle sophistication. 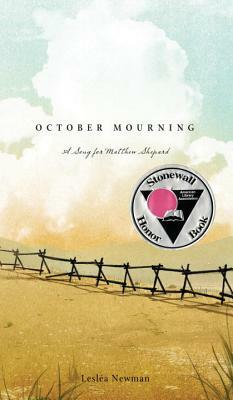 Newman is an impressive poet, and the collection, in addition to memorializing Matthew Shepard, is a call to action to let go of hatred and make sure nothing like this ever happens again. The book packs an emotional punch, and the skillfully crafted poems will make me never doubt Newman’s ability to handle a subject this brutal again. I think that she may be a genius. Does the work of preserving the atrocities of history while firmly offering a vision of choosing life. Refusing to let Shepard fade into oblivion, abstraction, statistic, or symbol, Newman here reminds us that the impulse to repair the world requires imagination as well as concrete memory. OCTOBER MOURNING is a stunning, poignant collection of poems that paints a picture of an event that none of us can ever afford to turn away from. This is a stunning reminder of what is lost as the result of bigotry and hatred.